Image caption The Shannon-class lifeboat is described as the "most agile and manoeuvrable all-weather lifeboat yet"
Lifeboat volunteers in Peel are to receive a new lifeboat two years earlier than expected, the RNLI said. 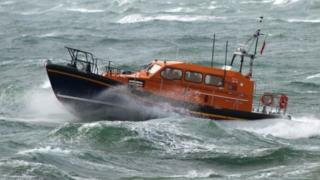 The charity says the Peel lifeboat station will now take delivery of the £2.2m Shannon-class lifeboat in 2019. It will replace the Mersey-class lifeboat and has the potential to halve the amount of time it takes to respond to emergencies at sea. The Shannon-class is the first modern all-weather lifeboat to be propelled by water jets rather than propellers. The station's current lifeboat has been in service for 25 years. Peel RNLI Lifeboat Operations Manager Allen Corlett said it is "great news". The Shannon-class is described as the "most agile and manoeuvrable all-weather lifeboat yet". Capable of reaching top speeds of 25 knots, is twice as fast as the Mersey-class.